silly, maybe. pointy pixie hat, definitely. I’ve knit several. 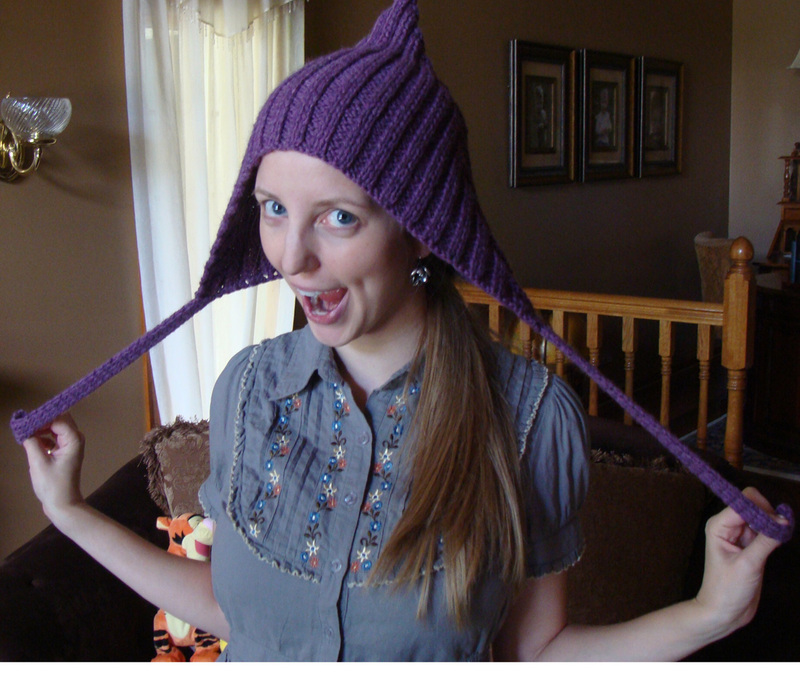 It’s just such a fun and rewarding pattern, such a fantastic hat to wear. I have one (teal), baby J has one (soft blue), baby C has one (dark purple), and baby A also (tan). Now my dear sweet sister-in-law has one, though it is pictured above modeled by yours truly. Christine can face the winter looking like the happy little elfin creature she is. I have a dear older brother who spends hours and hours in a cold drafty library in Indiana. He doesn’t just wander absently, meandering up and down isles of rarely-used books. No, he actually studies. Notre Dame gave him his own little tiny office where he does this important scholarly work. Also, in wintertime, the library is cold. My brother gets cold. Stephen needed something to keep his hands warm while typing and writing and flipping through pages of dusty books. 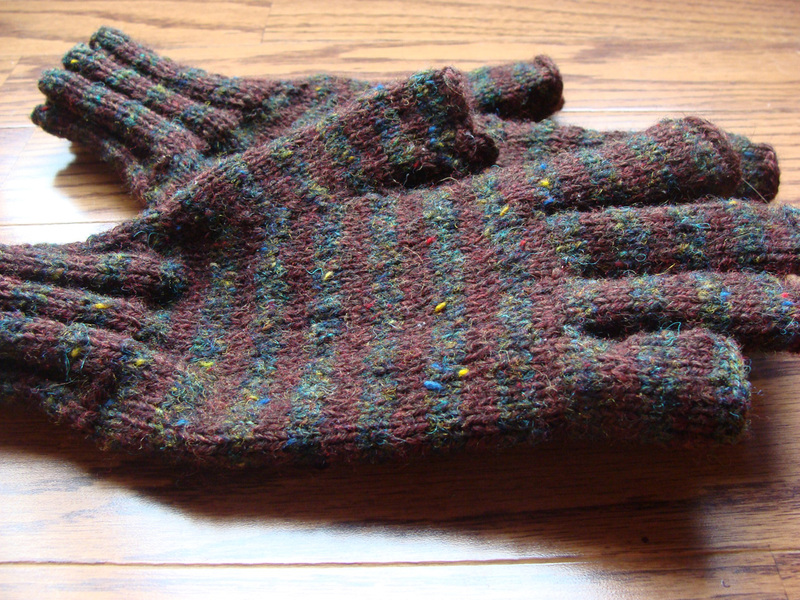 So I knitted him a pair of library gloves. Alyssa gave me the tweed. I love tweed. It’s Rowan, mostly dark green, with specks of almost every other color. I striped the Rowan with Knit Pick’s Merlot Heather held double. Three rounds of one color, three of another. All 100% wool. 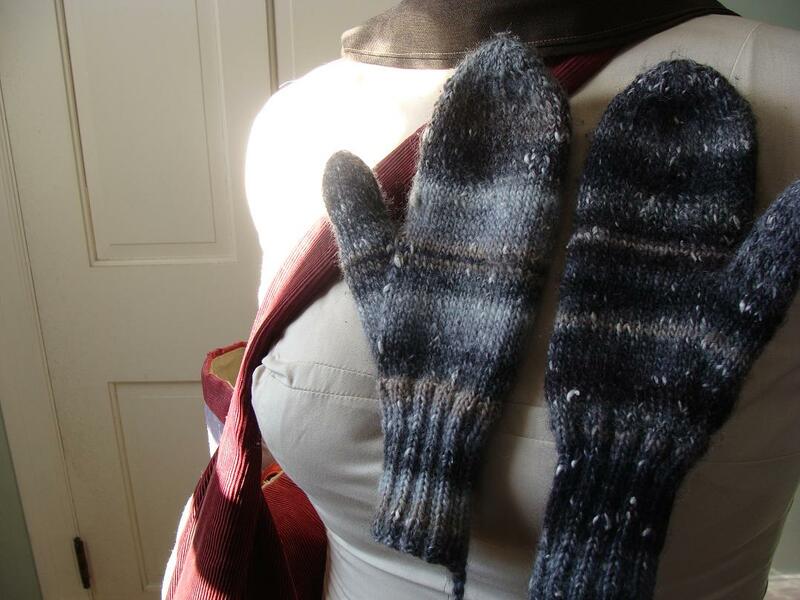 I combined my favorite classic mitten kitting pattern with Allison Isaacs and Sara Lucas’s tipless glove pattern (found in Holiday Knits) for this custom perfect-for-Stephen-and-his-nerdy-needs pair o’ gloves. How? With US size 4 dpn and a little twist of the imagination, of course. I think I cast on in early March and finished in late July. My goodness, what a slow knitter I’ve become! This was Stephen’s Christmas gift. Christmas of 2010, I’m ashamed to say. Now they are done and finally, he has them. Just in time for the colors outside to change to a more autumnal spectrum. to keep this paws warm. warm hands, warm heart, right? 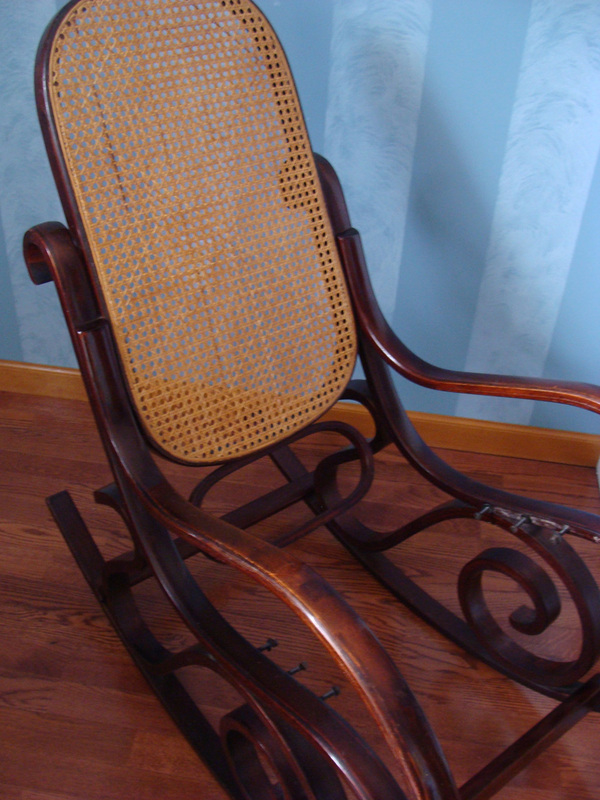 Here is the story of a very lovely bentwood rocker belonging to our friend Adam. Adam let us borrow this rocker when Juniper was first born. 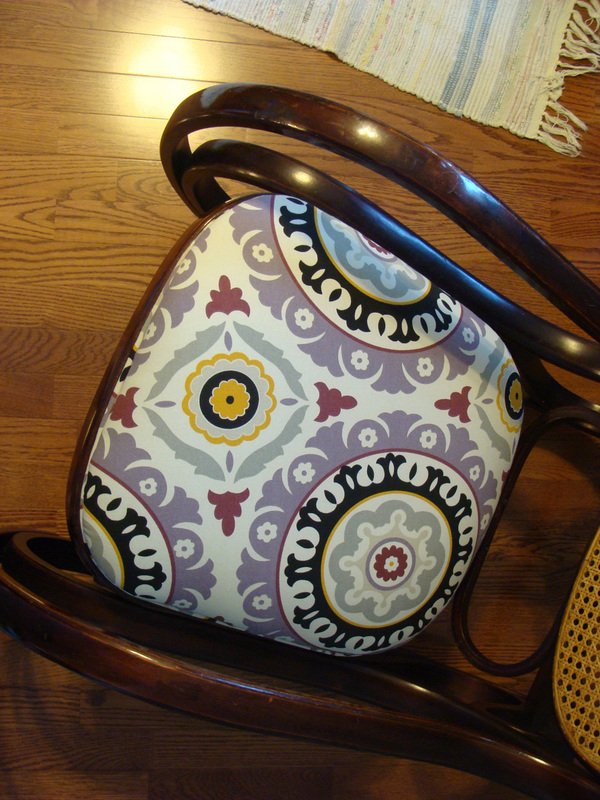 If you ever rocked in a bentwood rocker, you know the magic: the deep, smooth rock. The comfortable high back, perfect for resting a weary head. And the low armrests, so ideal for nursing a long baby. 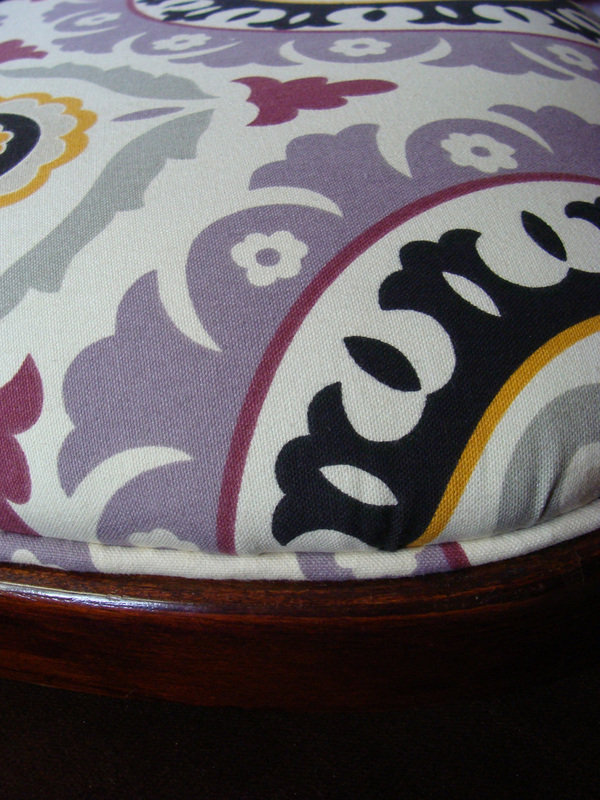 We loved rocking Juniper in this rocker. But Adam got the rocker used, the caning was old and brittle, and one day when Ryan sat down to rock baby Juniper, the caning gave out. Don’t worry; no one was hurt except the chair. A large hole in the seat rendered our favorite rocker unusable. How very sad indeed. So it’s been on my to-do list to fix the hole in Adam’s bentwood rocker. Unfortunately, I don’t know how to cane. Nor do I really want to learn at this time. I should mention that somewhere along the line, Adam gave us the rocker to keep forever. Thank you, Adam! 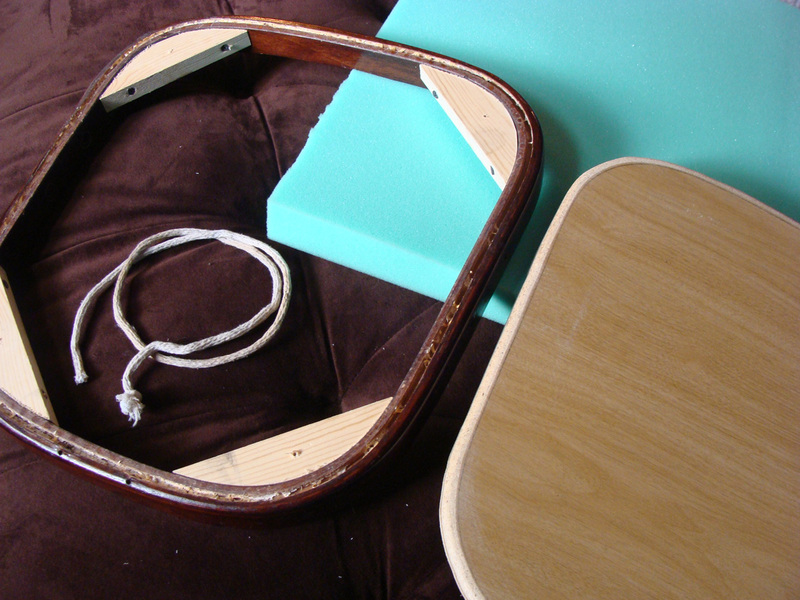 But back to my conundrum: how to fix the chair without recreating the original caning. 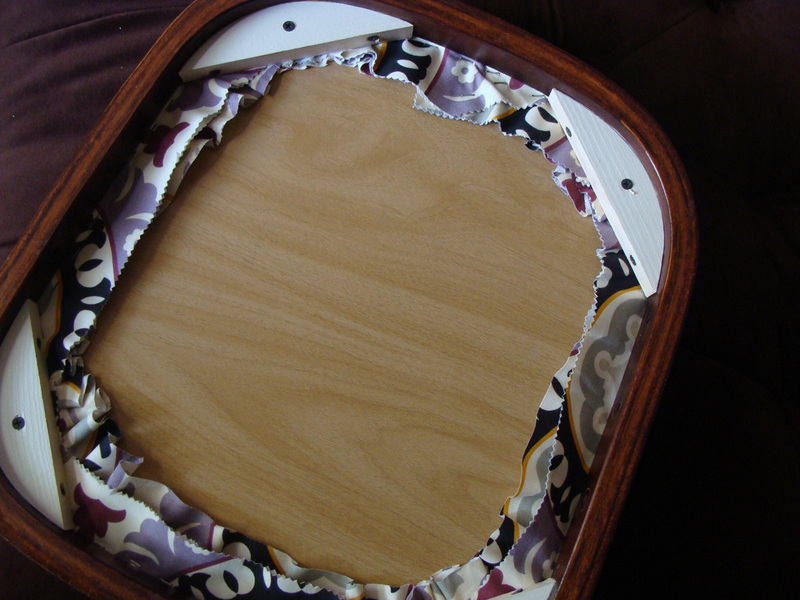 I thought maybe I’d turn the seat into something solid, cushioned and covered, if I found the right fabric. 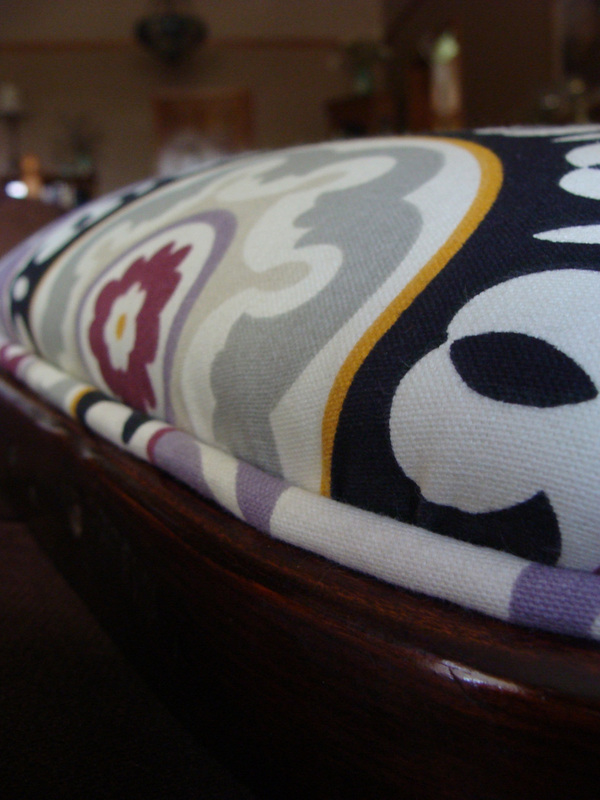 When I saw Waverly’s upholstery fabric “Solar Flair” on super-sale at Jo-Ann’s, I knew it was the one and could then visualize our redeemed rocker. So another redo project began. And here’s how we did it. First Dad and I took the seat off the rocker. I ripped out all the caning and touched up the wood on the rocker and the seat frame with a dark brown permanent marker. Once this was totally dry, I treated the wood and remaining caning with lemon oil, cleaning, hydrating and polishing all at once. Dad cut a piece of wood to fit, routered the edges, and cut additional corner pieces for sturdy assembly. I bought half a yard of 1 1/2″ foam from Jo-Ann’s (with a 50% off coupon, of course) and cut it the same size as the new seat. I sat at Grandma’s sewing machine (mine is lost somewhere in the chaos we call storage) and created the piping out of the new fabric and about a yard of soft, skinny rope. 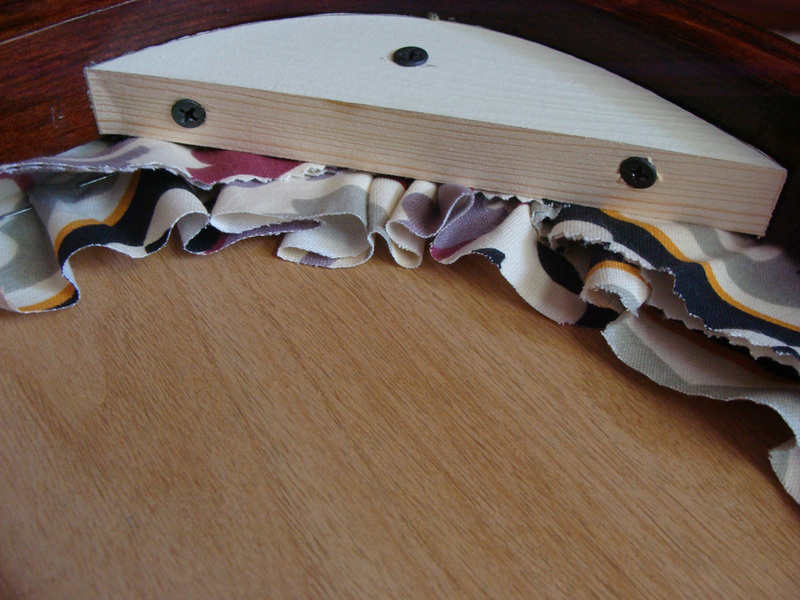 Together Dad and I stretched the fabric over the foam and seat and stapled, stapled, stapled. We put the piping around the edge and attached it with more staples. 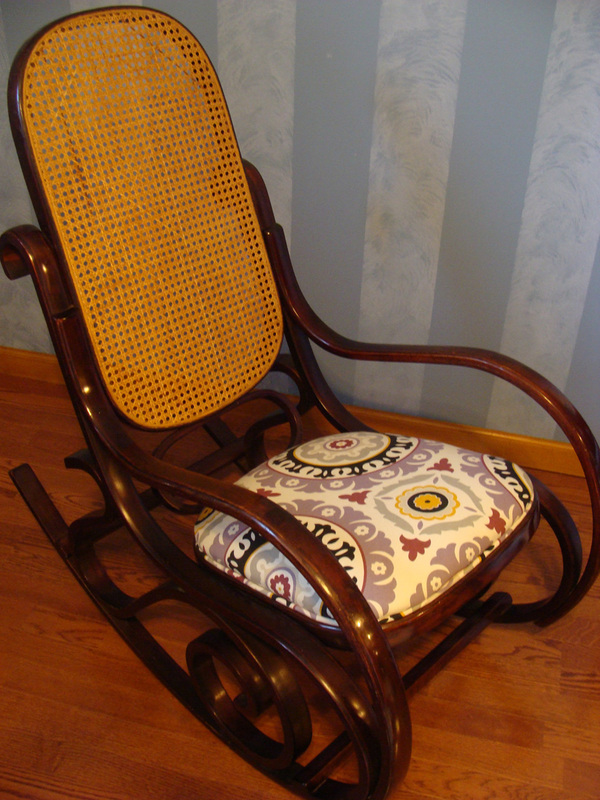 Then, using his drill, we secured the upholstered part to the original seat frame, put the whole mess back on the rocker, and – presto – a brand new rocking chair. and it's on the rocker! end of story: we rock once again. 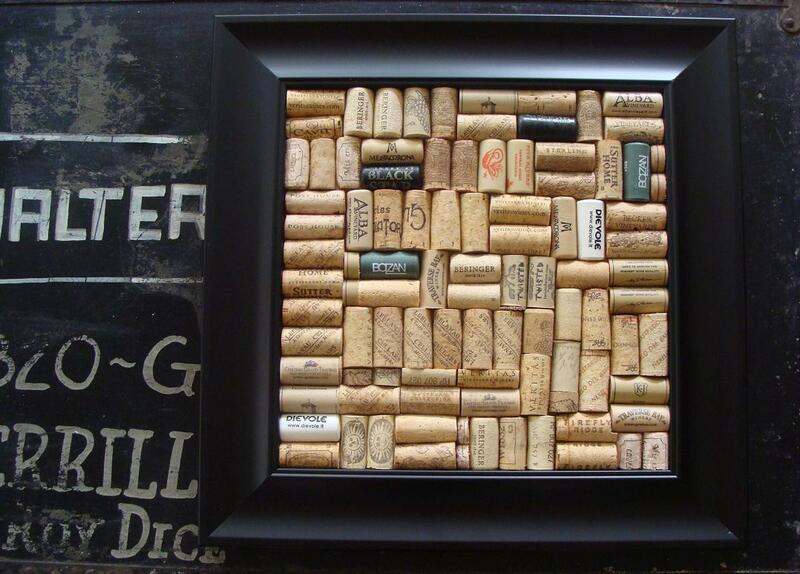 A funky and functional cork board made from a unique variety of custom cut and meticulously arranged wine corks, framed in a 16 inch square wood frame with black matte finish. 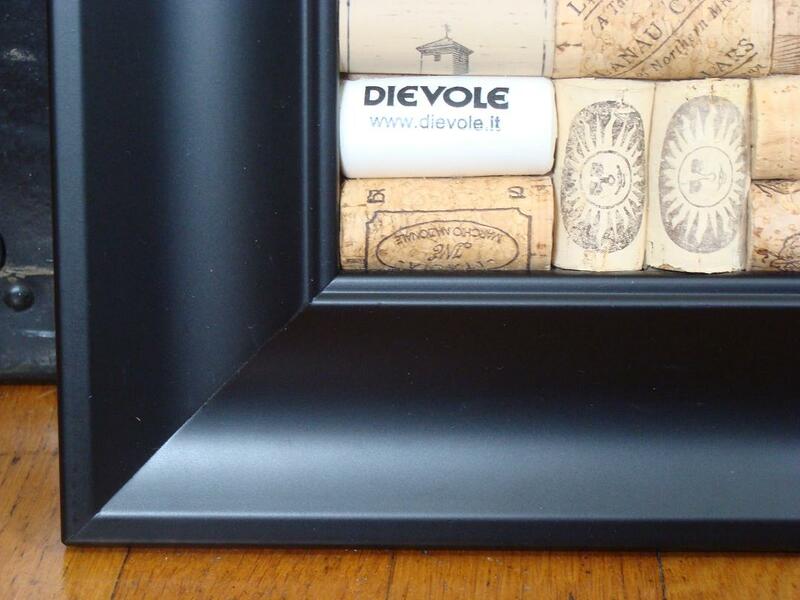 This cork board is ideal for kitchens, planning centers, home offices and craft rooms. Includes hardware for attaching to wall. Cost: $92 + $2 shipping. If you’re interested, please visit my Etsy Store to make the purchase. 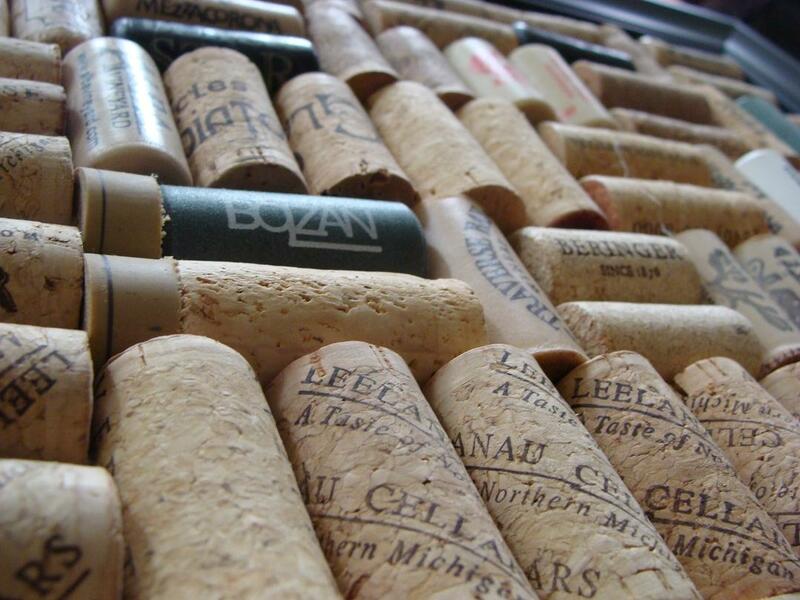 This cork board of wine corks is similar to my own kitchen cork board, which you can read about here. Quirky thumb tacks are not included, but I encourage you to find some! Here are ideas: buttons, fabric pins, or tree branches. Out in the big world there exists so many baby bootie knitting patterns; what is a knitter to do? What is a baby to do? I certainly haven’t knitted each pattern, nor has Juniper tested out each bootie design (she’s only four months old, you know), but we do have experience enough, I think, to form an opinion. 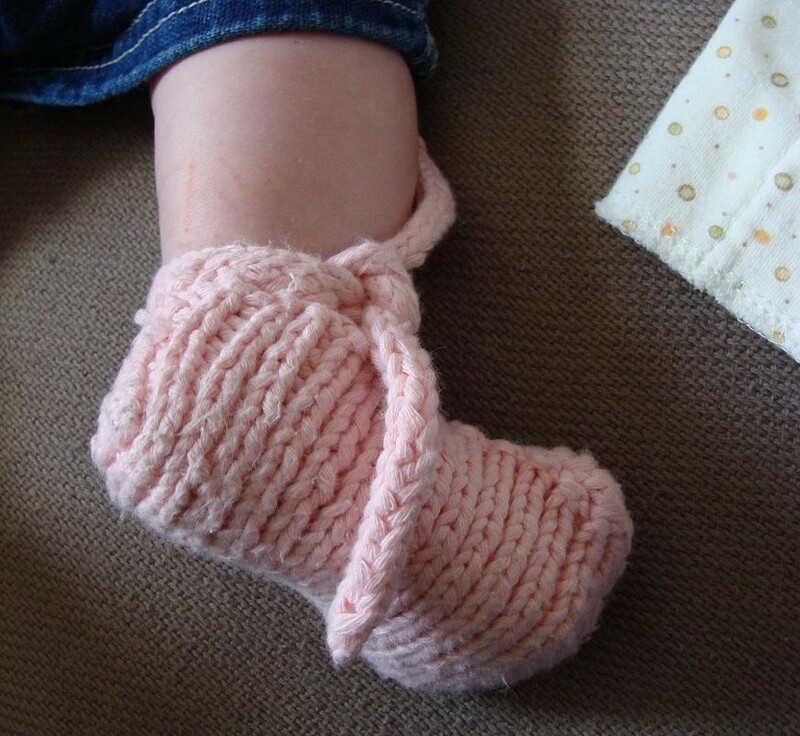 Our most favorite baby booties ever were actually the first project I attempted to knit, way back in 2008. The first project in First Knits (the book by which I learned to knit) are these lovely duck-feet booties. Alternatively, one could call them baby clogs. Either way, they are stinking cute and very easy to knit. Basically two different sized squares and one I-cord are strategically sewn together to make one infant shoe. And the best part? 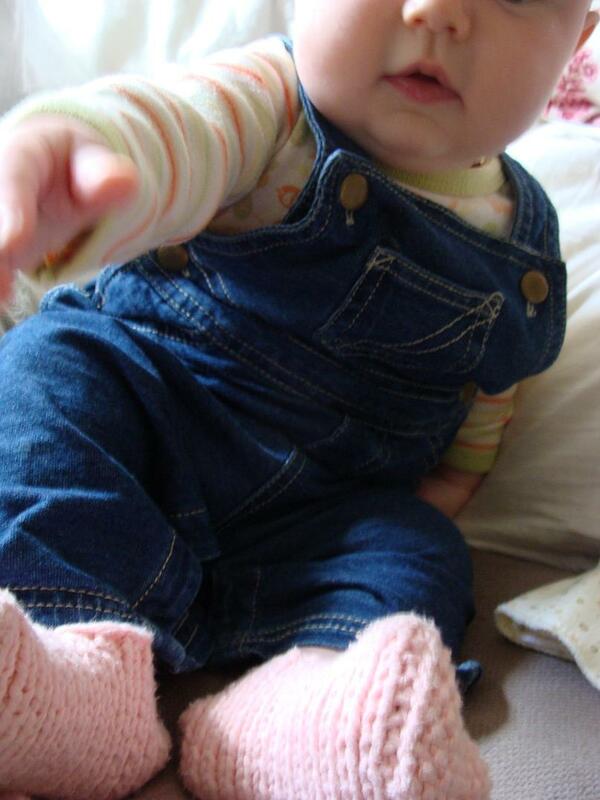 They stay on baby’s feet, even on one very kicky baby’s feet. Juniper is a kicky baby. So much so that her nicknames is “Kicky McGee.” She has also been called “Shrieky McGeeky,” but that’s a different nickname with a different, rather louder, story. baby duck feet, see? covering ten stinking sweet tootsies. 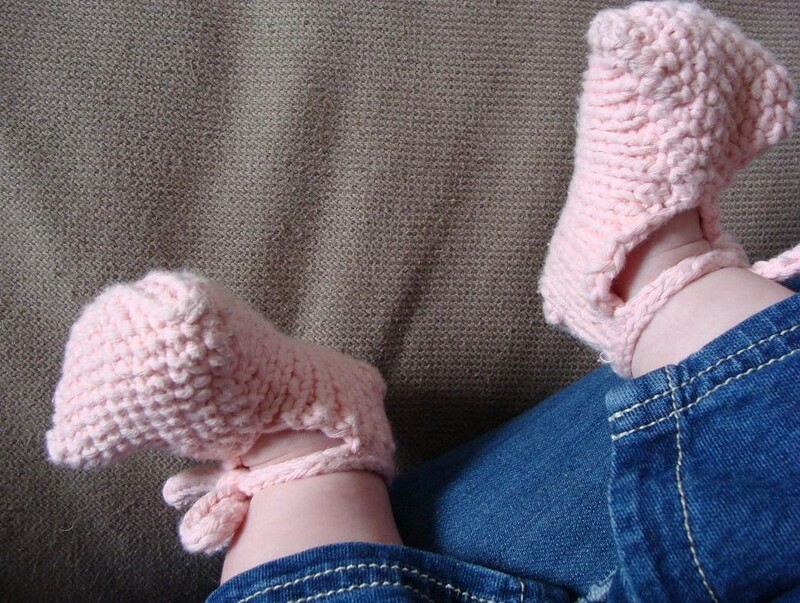 For Juniper’s pair of pink booties (those pictured) I used Phildar’s Partner 6, which looks and feels like cotton but is actually 50% polyamid, 25% wool and 25% acrylic (making it very machine washable; a handy trait for a baby yarn). 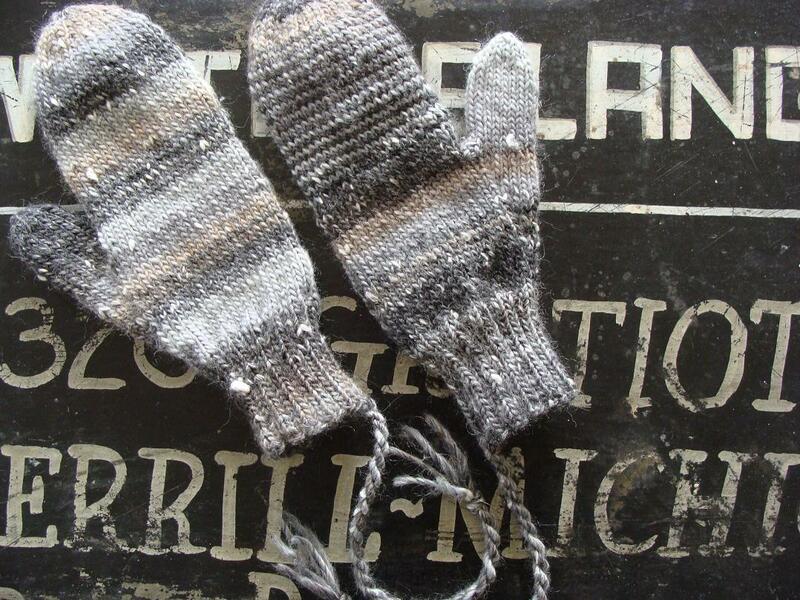 I knitted the body of the booties using US size six needles and finished by knitting the I-cord on US size six dnps. the tie (a 3 st I-cord) is knitted about twice as long as specified, so it can be half-bow tied. the tie is sewn on to the heel of the bootie off-center, such that said half-bow can be tied at the ankle instead of the front of the foot. the body of the foot (the larger square) is knitted in k1 p1 ribbing, allowing for stretch as the wearer’s feet grow and for a perfect fit every time. the toe of the foot (the smaller square) is knitted in a seed stitch pattern because I really like ultra textured look of the seed stitch. I’m the mother that usually does not dress her baby girl in pink. My Grandma said, before she met Juniper, that I probably have her in green and brown perpetually. She was right. I even buy blue teething toys just to break gender stereotypes. This really drives strangers crazy. Evidentially I have a responsibility as a new mother to make it obvious to the general public whether this baby is a girl baby or a boy baby. Even after knitting her a pair of pink booties, you’d be surprised how people still ask if she’s a little boy. Only very observant strangers pick up on this subtle nod to Juniper’s girlishness. A few years ago we were shopping at the Restoration Hardware outlet in Birch Run, which I’m told is actually no longer there, and dad found a perfect navy peacoat. Restoration Hardware peacoats are said to be authentic as they are made by Spiewak, the original peacoat manufacturer for the US Navy. This find was significant to us because when dad was a youth, he wore his father’s WWII US Navy peacoat until it was threadbare. I’m glad that roughly thirty years later he still had a hankering for similar sturdy wool outerwear. With his salt and pepper beard, my father is nautical, nostalgic and very handsome all at the same time. 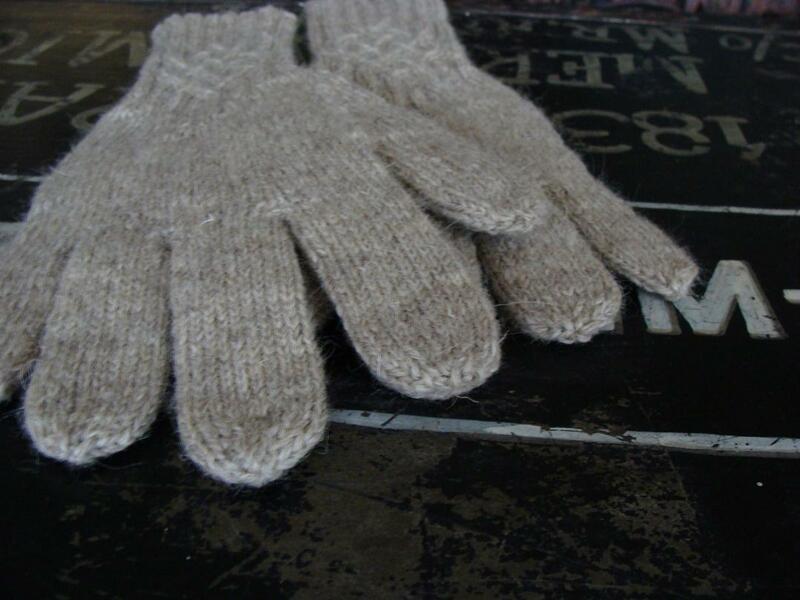 So for a while I’ve wanted to knit dad a pair of wool gloves to accompany his peacoat. Life gets busy and my knitting queue is ever-growing but finally I found a piece of time to knit gloves for dad. When I was last home in September, I had him trace his hand on a used envelope. 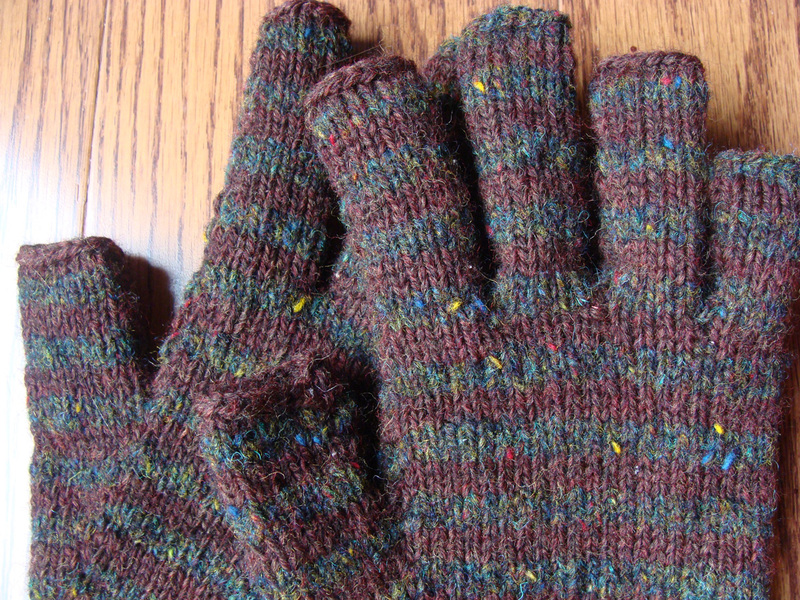 Lucky for me, my first attempt at custom-fitting gloves was a success; I doubted that just by measuring a traced hand I’d be able to knit the finger lengths correctly. But it worked! Dad’s birthday was on the third of this month and from what I understand, he likes his birthday gloves very much. They are currently housed in the pockets of the navy peacoat, hanging in the front closet. My folks live in Michigan, so the cold will probably last long enough for him to wear them a number of times before the season changes. 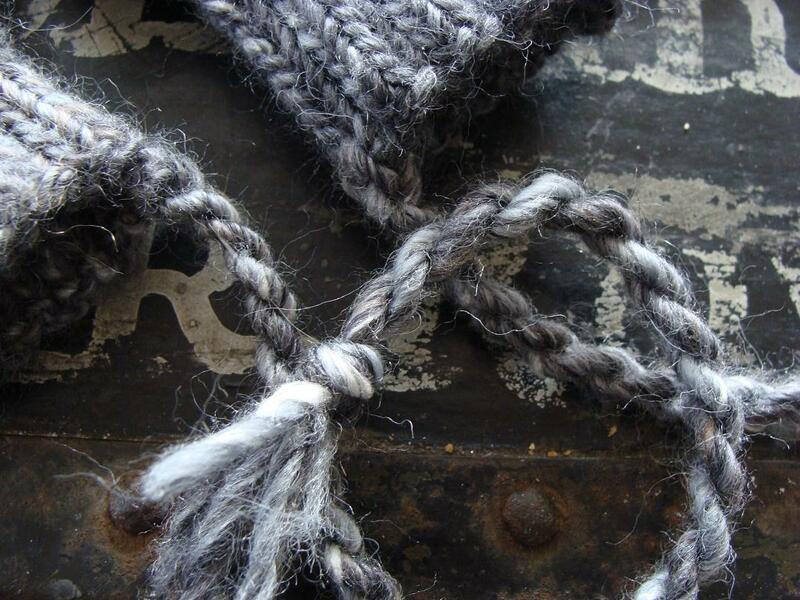 On Ravelry, the most popular glove pattern (actually the 96th most popular pattern of them all) is the Knotty Glove. 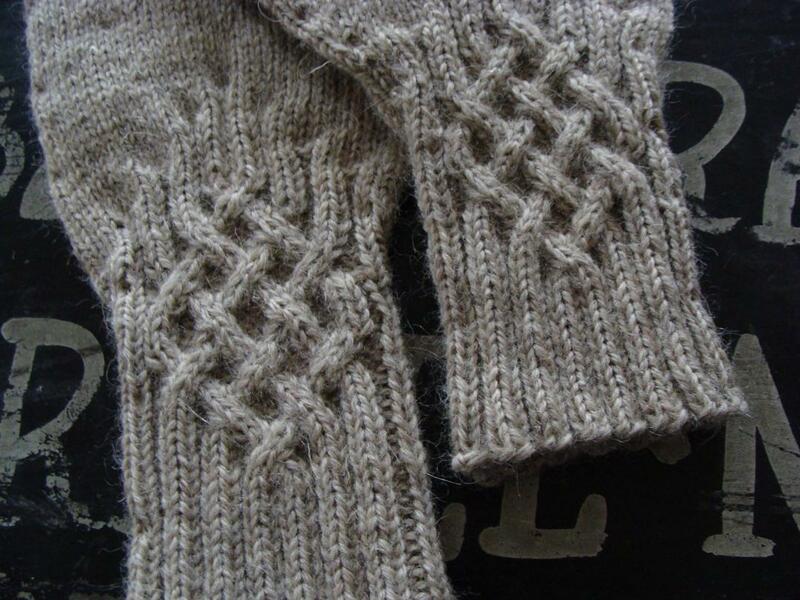 The cable design is somewhat Celtic, but if you squint and tilt your head at just the right angle, you see these gloves are very nautical indeed. Besides the custom finger lengths, I made a few changes to this pattern. 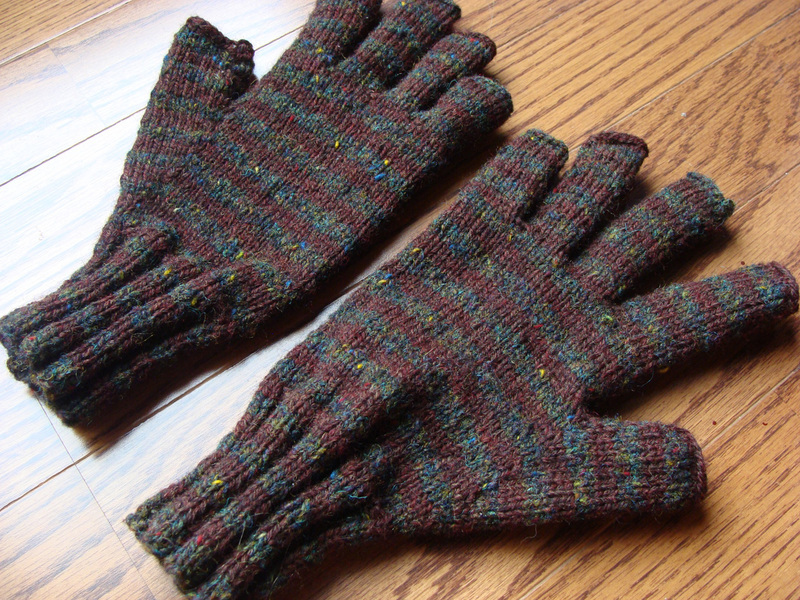 In order to fit dad’s large carpenter-man hands, I knitted with US size 3 dpn instead of 1.5 as the pattern recommended. Also, I didn’t knit the cuff as long as was specified; for a more masculine look, I knit only for one and a half inches before starting the knotty cable pattern. 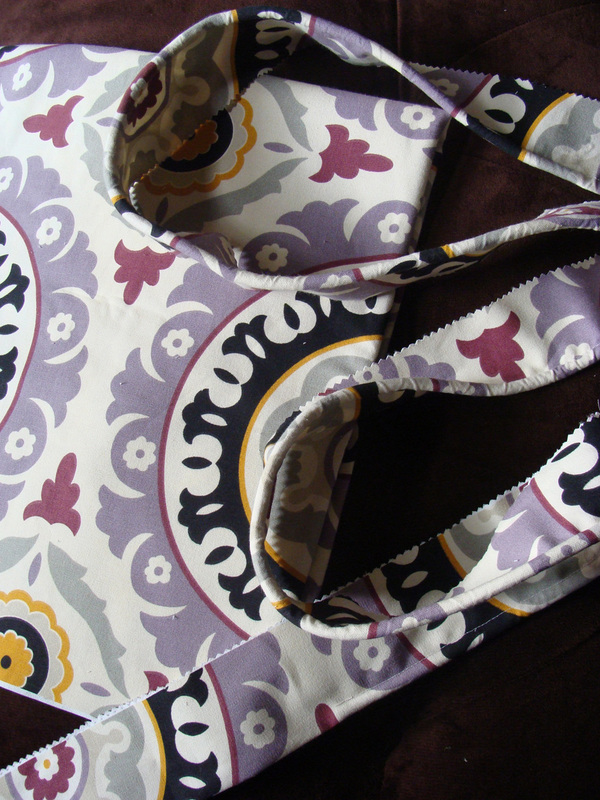 Lastly, I changed the cable pattern so the right and left hand designs were mirrored instead of repeated. I used Fibra Natura Shepard’s Own yarn, 100% undyed lightweight wool which I very much recommend. It’s a very woolly wool, no fussiness, bells or whistles. I have about six skeins of the same fiber in a slightly darker color which I’ll be transforming into a sweater for myself sometime in the hopefully near future. 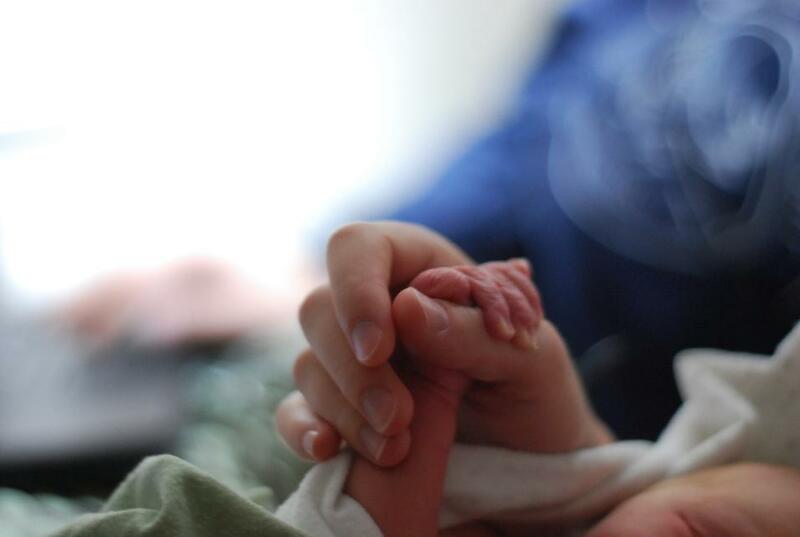 Dad’s fingers and hands will stay warm and dry inside his new knotty gloves. This makes me wonder if my grandfather’s fingers and hands were warm and dry throughout the war. But maybe he didn’t really need gloves, as he served in the Southwest Pacific. If he did, though, I’m sure Grandma would have supplied him with a lovely pair. In late fall, a few dear friends took me on a surprise “pamper the mama-to-be” date which included a tasty lunch out and a trip to our new yarn store downtown. Any outing involving a yarn store is a fabulous one in my book, but this one was extra great because it 1) was a surprise 2) included food and 3) was time spent with very sweet friends. They treated me to any yarn of my heart’s desire (!) 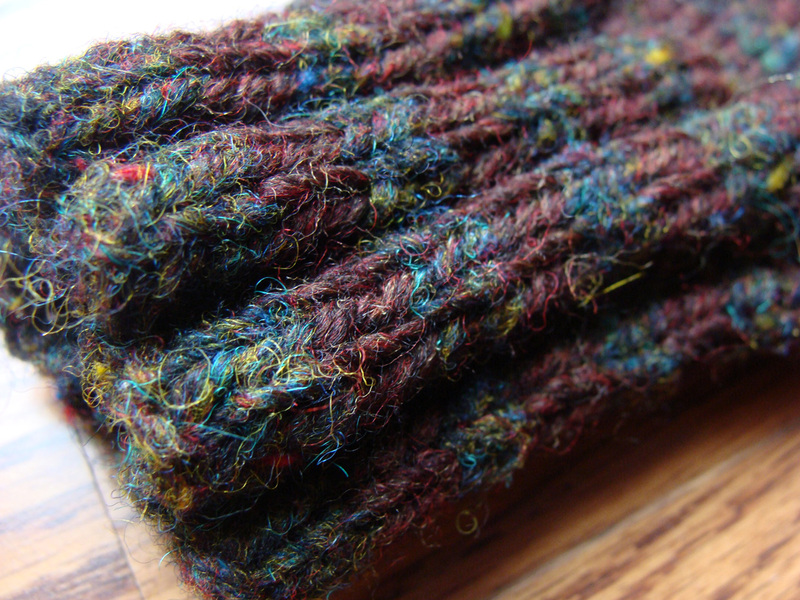 and I found Plymouth’s new Mushishi (95% wool, 5% silk) simply delightful. All kinds of grays, a few light tans, flecks of white and some lovely deep blacks all in one skein. Heavenly. I’m not one to usually knit with multi-color yarn, I mostly prefer solids, tweeds and heathers, but Mushishi was just so fun to knit up. Every few inches of yarn kept me guessing and with the random color variation, I had no idea how my end projects would look. I loved the suspense. So far with this one skein, I’ve knitted two pairs of mismatched mittens. And I have yarn leftover for another small project. As always, I used my favorite mitten pattern which can be found for free here and knitted on US size 4 double-pointed needles. For the right-hand mitten of the second pair, I used two different balls of yarn from the same skein and created a subtle striped pattern by changing yarn every other round. And for each pair, I added a twisted tie and tassel for good luck, charm, and practicality. 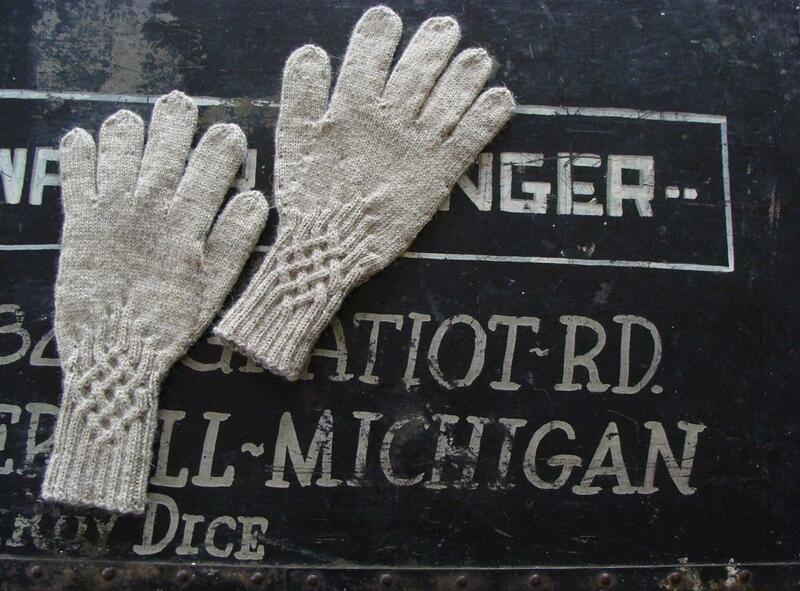 Wool mittens on a cold winter day, what could possibly be better? Thank you, Lynsey and Stefanie, for this amazing yarn! May you always have warm fingers and warm toes for as long as you face these harsh[ish] Virginia winters. juniper was born at home, in a birth pool in the middle of our kitchen. read the story here.